The Isle of Man TT Website - Raymond Hodges Knockhill Experience! When I called Lisa Ross from Oulton Park on a Sunday to update her with Paul Robinson's race results I had no idea it would lead to me riding her bike at Knockhill, with free wheeling down the hill into the paddock at Brands Hatch being my only experience onboard a RS125 Honda, still I thought if a wee woman can do it so could I. So when we got to the ferry that night I rang Lisa again and told her I would have a go. Once home on Monday morning I asked an astonished Paul for advice and details on how to get a competition licence, then armed with telephone numbers ,names and addresses I went about applying for my licence, first of all joining a club, then doing a medical which I couldn't get an appointment for until the Thursday, two before posting all the information off to the licence registrar who was going away for a few days that weekend and would deal with my application on his return on Tuesday, could this have been an excuse to back down ?, No, I received my licence through the post two days later on Thursday morning. Word soon spread around Ballymoney of my racing debut with friends and workmates now calling me Hodgie Ui , Rocket Ray , Ray Racing etc and I was really amazed at the amount of help and support I was receiving for my racing adventure. With the van loaded up with what we could borrow from Paul's garage, and leathers from Adrian Archibald, Johnny and I set off to the ferry on Friday evening destined for Markinch, arriving just before midnight to a welcoming cup of coffee and a carry out from the chinky before going to bed for a restless nights sleep as nerves started to set in. Next morning trying to hide my nerves we loaded Lisa's wee baby into the van and left for Knockhill, calling at the local airport to get fuel for the bike for the next two days, getting parked in the paddock, setting up and signing on for the days practice kept my mind off what lay ahead until Lisa took me for a walk around the track so I would have some idea where I was going and before I knew I was sitting in the holding area ready to go or not as the case may be. Lisa had arranged with Bob Grant to show me around for the first couple of laps, but not being used to riding a screaming two stroke I soon had the bike bogged down with it missing and spluttering or was the bike just complaining with having to carry someone slightly heavier than the six and a half stone mother of two it normally carries, so after two laps I pulled into pit lane had a word with Deek before deciding to continue if only to get used to the bike and track because after my first effort it was something I really needed. What really surprised me most in the first session just how much strain was put on my arms under braking and also how quick one of these little 125 Honda's could go which left me wondering just what had I undertaken but still determined to carry on. 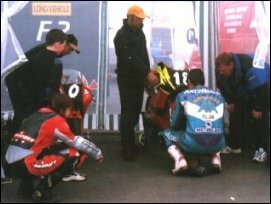 In the next session with a little more idea of what to expect I was now able to start thinking of the advice Lisa had given me about racing lines into blind corners, braking markers and what I should be doing as well as concentrating on which gear I was in for different corners. Leaving my lap times being able to be timed on a stopwatch instead of a calendar. In the last practice session still coming to terms with everything I was quite pleased when I pulled a wheelie coming out of the hairpin. 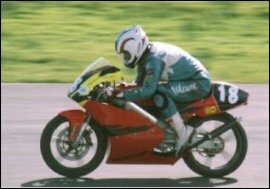 I had only one horrifying moment going into Duffus Dip with the back wheel well up in the air under braking while I was along with a group of 250 Aprilia's. After what should have been a very enjoyable day with blue skies and bright sunshine, disaster struck when a gust of wind blew the awning over the top of the van causing quite a bit of damage, which was temporally repaired, wound back in and held together with motor cycle racer's most important piece of equipment in the paddock duc tape. Then returning to Markinch for an hours sleep as I was absolutely shattered both mentally and physically. Sunday morning came rather sooner than I would have liked especially when I got to the circuit and saw the damp conditions, though fortunately for me the weather improved as the morning progressed and by the time I was due to go out for practice there was a dry line appearing so I opted to go out on slicks as to not destroy Paul's brand new set of wet tyres. Taking things rather easy (riding like an old woman) I did a few laps with getting Lisa's bike back to the paddock in one piece my main priority, as there was nothing to gain by putting the lot down the road and probably a lot of ear ache from Lisa if I had. With the qualifying heats for the other classes over and the improving weather there was a completely dry track as I lined up on the grid for my first ever race with my novices bib on which Lisa found quite amusing. Making an absolutely awful start, I think they should have changed the programme to read There will be a delay of ten seconds between the GP125 class and Raymond Hodges and a further ten second delay to the Classic but may be at the age of forty four I should have been in the classic race. Seeing Rickki McCready walking through the gravel trap at Duffus Dip was the next time I saw any of the other 125 competitors until the I was lapped by the leading duo of Ronnie Lindsay and Anthony Czyzewski on the last lap. With only six starters and Rickys early exit I knew I had secured fifth place and eleven points in the bag as I crossed the finish line with only a finish required in the second race to leave me ahead of Lisa in the championship standings. A change of tyres for the second race and my experience was really starting to show, as I only gave the rest of the field about a four second start with the race being stopped after two laps when Anthony Czyzewski came off at Clarks. It was quite shocking to see him lying motionless at the side of track. From the restart I made an excellent start actually getting off the line first before backing off at Duffus Dip to let the others past, then to my surprise I completed two laps not in last place before Michael Robertson came past, then with the visor on my helmet coming loose and flapping about I had an excursion onto the green stuff at Clarks which left me further behind but I still had another eleven points at the chequered flag for fifth place and ahead of Lisa in the championship (mission accomplished).After the race I was on a real high as I realised I was actually getting close to setting some reasonable lap times and knowing where I could improve (just about every where) I would liked to have had a third race. Back in the paddock Lisa gave me a bottle of champagne from which she and Deek got a good drenching and saving enough for Johnny to get a drink ended a perfect weekend and as the adverts say Knockhill Racing Circuit sets your pulse racing. Returning home to Ballymoney just before midnight on Sunday night with my pulse still racing, I decided I am going to have another go at Knockhill and not announce my retirement on my debut, so now I'm in the process of buying my own RS125 to do the remaining four rounds and looking forward to challenging Lisa on her own door step, I might even practice my starts before then because if making bad starts wasn't embarrassing enough, to have a six and a half stone mother of two with photographs to prove it is worse. I would like to thank Lisa & Derek Ross, Johnny O'Neill, Connolly Transport, Paul Robinson, Adrian Archibald and all those who helped me at Knockhill for a unforgettable experience.